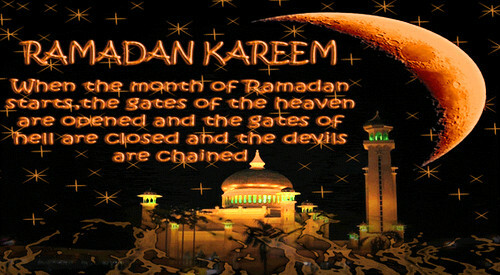 The month of Ramadan is a blessed month for many reasons, so we must be sure to take advantage of all of its blessings. The month of Ramadan in which was revealed the Quran, a guidance for the people and clear proofs of guidance and criterion. So whoever sights the month, let him fast it. Whoever is ill or on a journey, then fast an equal number of other days. Allah intends for you ease and does not intend for you hardship and for you to complete the period and to glorify Allah for that to which He has guided you, for perhaps you will be grateful. During the month of Ramadan, Satan finds it more difficult to mislead the Muslims, so it becomes easier for Muslims to perform good deeds. When the month of Ramadan begins, the gates of the heaven are opened and the gates of Hellfire are closed, and the devils are chained. The month of Ramadan is blessed because Muslims can receive forgiveness for their sins due to their prayers and fasting out of sincere faith. The five prayers, Friday to Friday, and Ramadan to Ramadan will be expiation for the sins between them, so long as major sins are avoided. Whoever fasts the month of Ramadan out of faith and seeking reward, then Allah will forgive all of his previous sins. Whoever stands in the night prayer during Ramadan out of faith and seeking reward, then all of his previous sins will be forgiven. The month of Ramadan is blessed because the virtue of fasting is magnified, even though it is already a great virtue. Allah said: All the deeds of the children of Adam are for them, except fasting which is for Me, and I will give the reward for it. Fasting is a shield. If one of you is fasting, he should avoid intimate relations with his wife and arguments. If somebody should fight or argue with him, he should say: I am fasting. By Him in whose hand is my soul, the unpleasant smell coming from the mouth of a fasting person is better in the sight of Allah than the smell of musk. There are two pleasures for the fasting person, one at the time of breaking his fast and the other when he meets his Lord; then he will be pleased because of his fasting. Verily, Allah has people he redeems at the time of breaking fast, and that is during every night. The month of Ramadan is blessed because during it occurs the Night of Decree (laylat al-qadr) during which worship for one night is better than worship for a thousand months. Verily, We sent the Quran down during the Night of Decree. What will make you know what is the Night of Decree? The Night of Decree is better than a thousand months. The angels and the Spirit descend therein by permission of their Lord for every matter. Peace is therein until the emergence of dawn. Whoever stands in prayer during the Night of Decree out of faith and seeking reward, then Allah will forgive all of his previous sins. Allah has made a night during Ramadan that is better than a thousand months, so whoever is deprived of it is truly deprived. The exact date of the Night of Decree is unknown to us, but it occurs sometime during the last ten days of Ramadan. This encourages us to strive hard in worship during the last ten days. Look for the Night of Decree in the last ten nights of Ramadan, but if one of you is weak or frustrated then do not be overcome during the remaining seven nights. The Prophet, peace and blessings be upon him, would exert himself in worship during the last ten nights more than at any other time. It is recommended to perform a retreat (i’tikaf) inside the mosque during the last ten days of Ramadan as a means of receiving its blessings during this time. The Prophet, peace and blessings be upon him, used to retreat in the mosque during the last ten nights of Ramadan until Allah the Exalted took him. His wives continued to observe this practice after him. Whoever desires to follow the example of the Prophet, peace and blessings be upon him, should seek seclusion in the mosque during the last ten nights of Ramadan; so let him enter the mosque before the setting of the sun on the twenty first night. Overall, Muslims want to greatly increase their acts of worship during the month of Ramadan, such as reciting the Quran, performing prayers, and giving in charity. Our companions said that being generous and performing favors are highly recommended during Ramadan, specifically during the last ten nights. By doing so, we emulate the example of the Messenger of Allah, peace and blessings be upon him, as well as our pious predecessors. This month is honored and good works carried out in this month are more blessed than they are at any other time. We ask Allah to allow us to reach this blessed month and to benefit from its virtues.